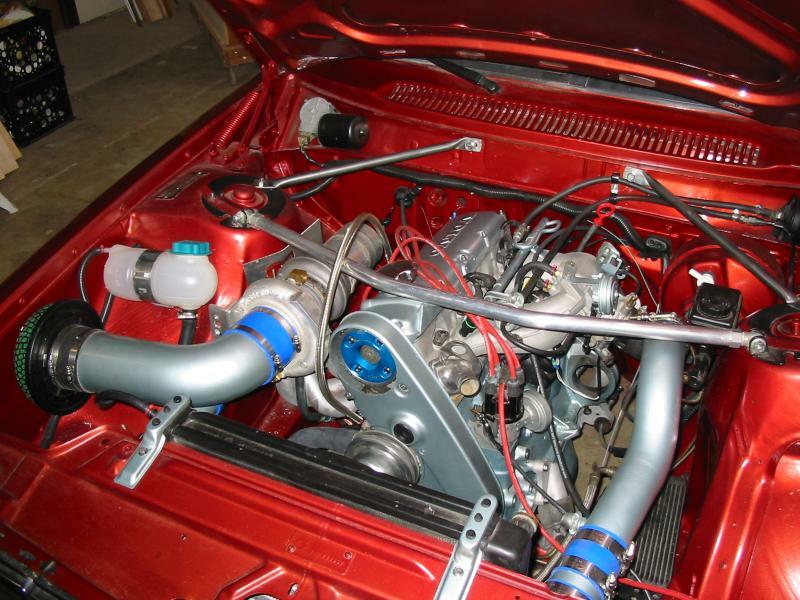 Rebuilt B23FT (2.3L), decked, oringed. Mircopolished crank, hi flow oil pump. Painless wiring fuse block, rewired car from scratch. Last edited by Hank Scorpio; 06-25-2005 at 07:17 PM.. I always liked that car. Do you still have some pics of before and during? 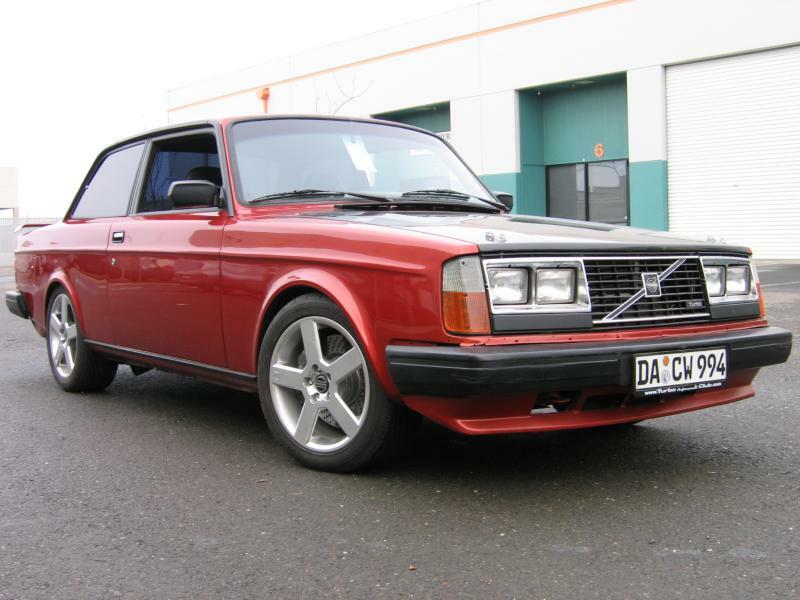 Maybe you can edit and paste some of the ClubVolvo article stuiff for here. Glad to see a thread about the car Doug! I have some saved pages from Dougs odyssey with building the car. Let me know what you'd like to see. Here are some previous things I have recovered. Beware not all the links will work atm. 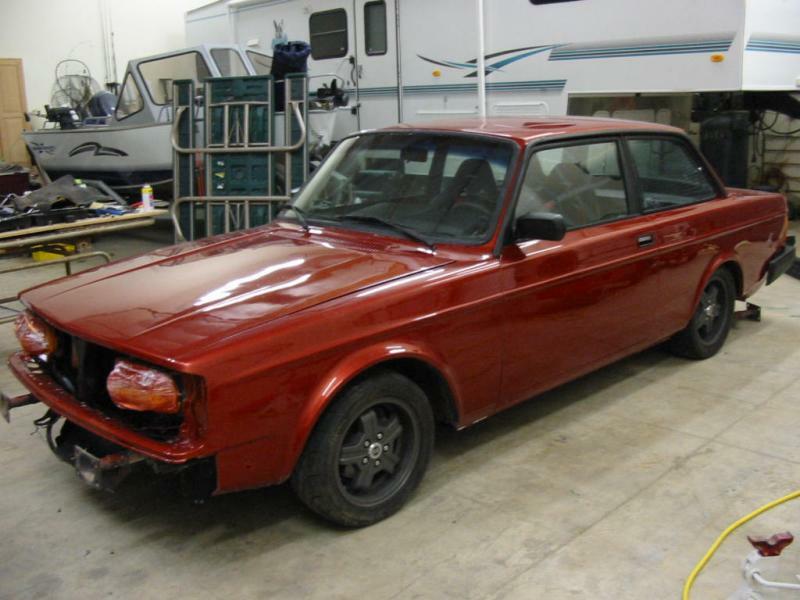 Welcome to ClubVolvo’s Project 242TI page. This page is dedicated to a overview of the build up of the 242 over the year of 2003. 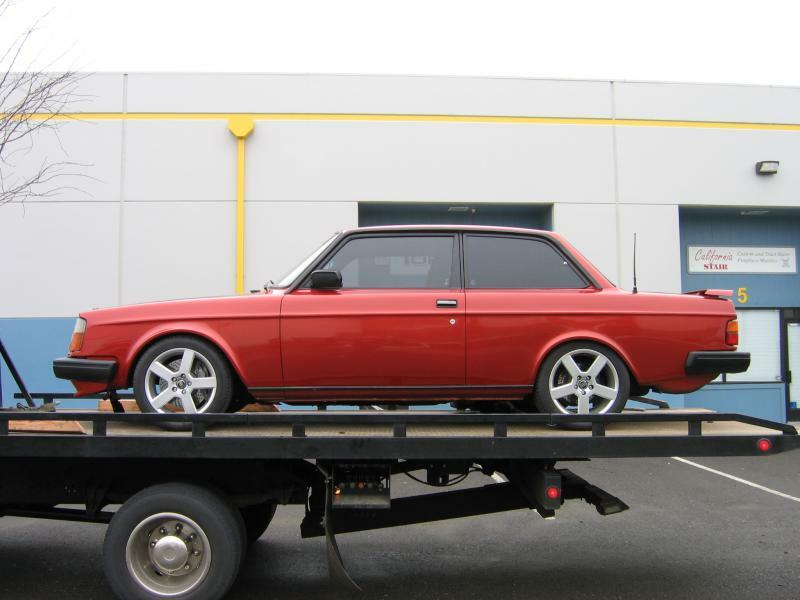 My 242 was purchased with 260+K miles from a local friend of mine who’s kids drove it since new, and managed to beat it to death. When I bought the car it had 2 flat tires, wouldn’t start, windows wouldn’t roll up, seatbelts didn’t work, broken windshield, NO synchros in any gear ect, for 200 dollars in August of 2002. Among the first things I set out to do with the car was to just get it drivable and street legal. This required the repair of numerous items and safety issues. Once this was completed, I spent a couple months deciding on what I had intended to do with the car and where to start first. I honestly started with the intentions of a budget racer, set up for track and drag racing use. So after making the car drivable, I decided the interior the interior was the first thing I wanted to attack, as not only was the interior “rough” it was the ugly brown that was growing on my nerves. 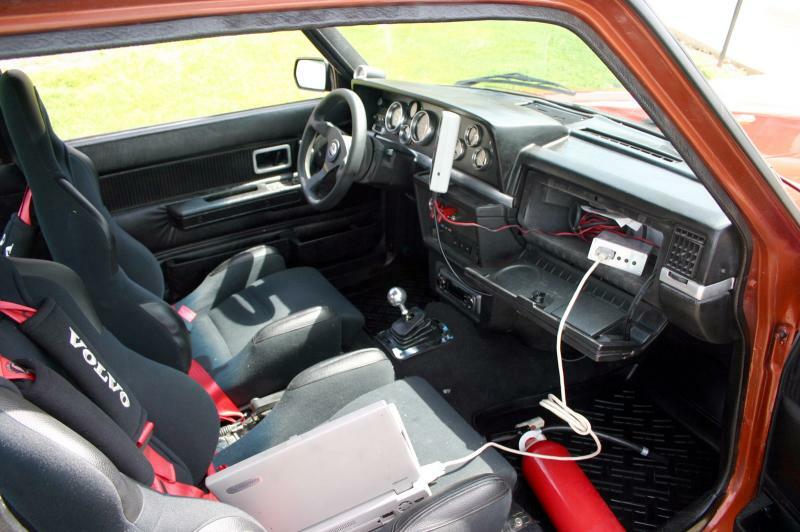 I had access to an almost complete black interior from an 85 244TI, what I couldn’t swap I painted using Dupli-color interior paint. Works like a charm. After getting the interior up to par, I started with the suspension. This took me a couple days to complete, but I installed IPD sway bars, bilstien shocks, MVP poly bushings , older style IPD strut tower brace, GT braces, 205/50/15 Falken Azenis Sport tires on repainted Virgo’s. I also installed my MVP 3” turbo back exhaust at the same time as I was already under the car. 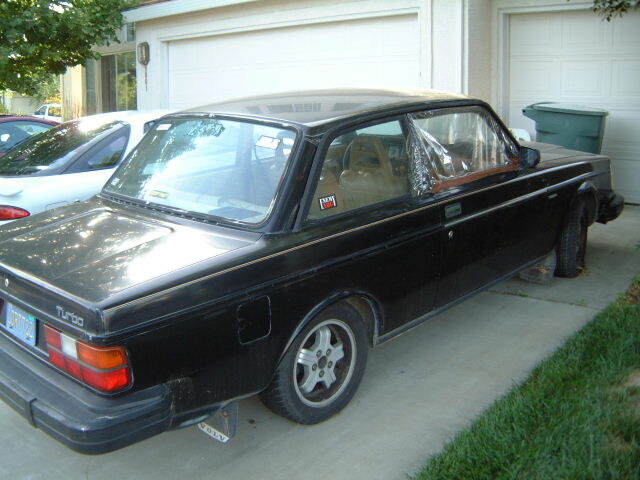 Around this time, I had a b21FT that I pulled out of my 85 244TI parts car. So I began to build it right around this time. 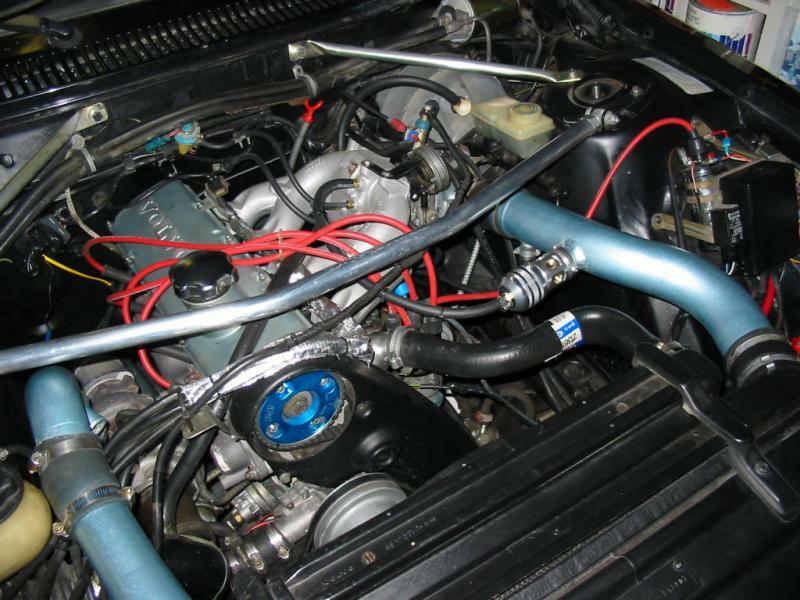 I had the head heavily worked over, installed an IPD VX cam and adjustable cam gear, 60 trim turbocoupe ford turbo a freshened bottom end. I installed this with a Centerforce clutch and new(er) m46. Somewhere along the line, I had also converted to a Flathood from an earlier 240. 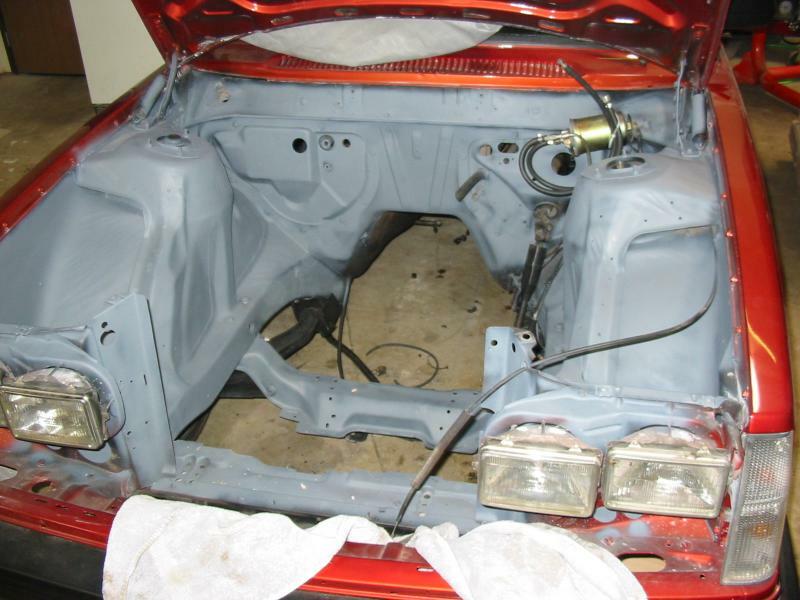 Around March of 2003 I stripped the car down for paint. I finally decided on a color, Sunset Metallic Orange, which I think came out positively stunning on the car. It took about to months and I had the waistline trim filled while it was painted. Around this time, I shifted goals with the car. I decided that in the couple months I drove it with the 60 trim turbo and VX cam, that it wasn’t enough for me, so I “upgraded”. Ended up buying a Enem K15 cam from Sweden and a WH1C Holset turbo off a Cummins diesel Dodge. This set up proved to be to much for the stock K-jetronic mechanical fuel injection, and in early April I converted the car to Megasquirt EMS. 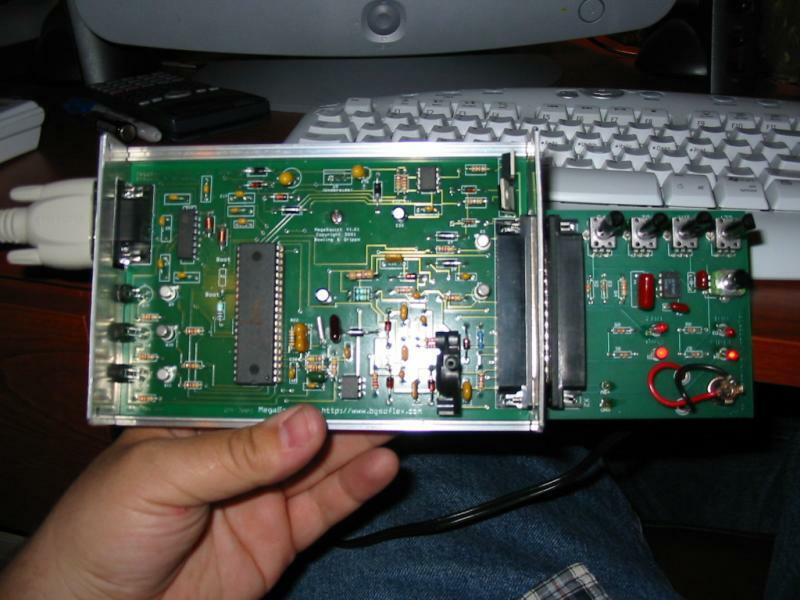 it’s a DIY kit that you can purchase for under 200 dollars, and does a heck of a job controlling fuel. Plus, because its map based, it isn’t effect by BOV’s and offers no (if you so desire) restrictions to the intake tract. Almost immediately after the megasquirt/holset install, I decided that I no longer liked the blacked out engine bay compared to the rest of the car. So in late April early May I pulled the motor to paint the engine bay and tackle a few other area’s of the car while I was there. Amongst other things, I wanted to tackle rewiring the car, installing a header and doing my T5 transmission swap. 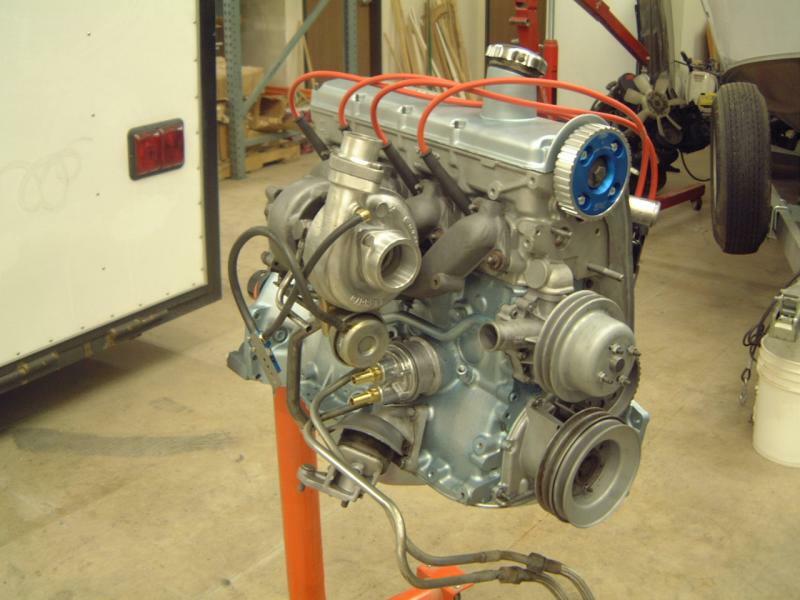 Since early 2003, I had been quietly working with John Parker at www.v-performance.com about making up OHC T5 transmission adapters. John already made the adapters for OHV motors so it wasn’t a new thing to him. I must say, the quality of his machine work and his help over the phone later down the road was invaluable. 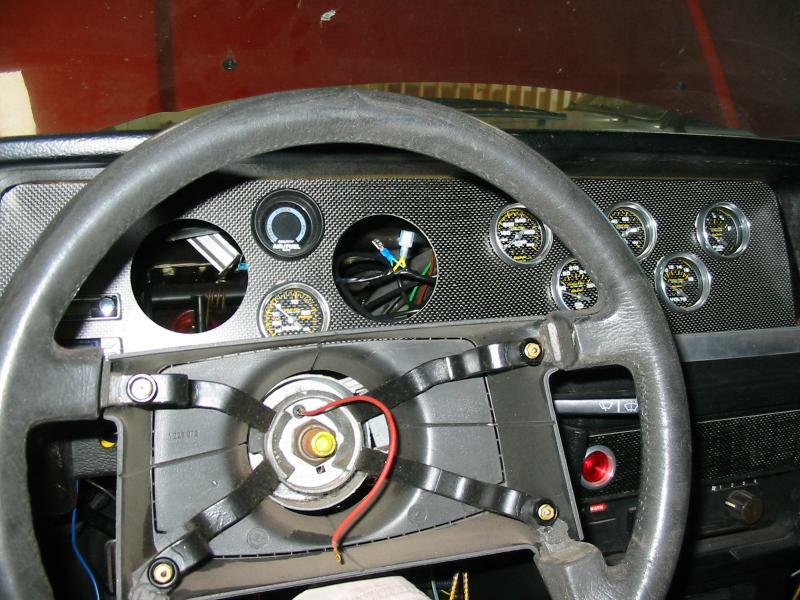 Since I was rewiring the car, I decided to remove all the factory gauges and make my own cluster out of Carbon Fiber. A local friend of mine (in trade for converting his 242TI to a 230FT intake) laid up a sheet of CF for me which I milled on my CNC at the shop. I used all new Autometer Carbon Fiber Gauges in support of the couple existing gauges I already had. 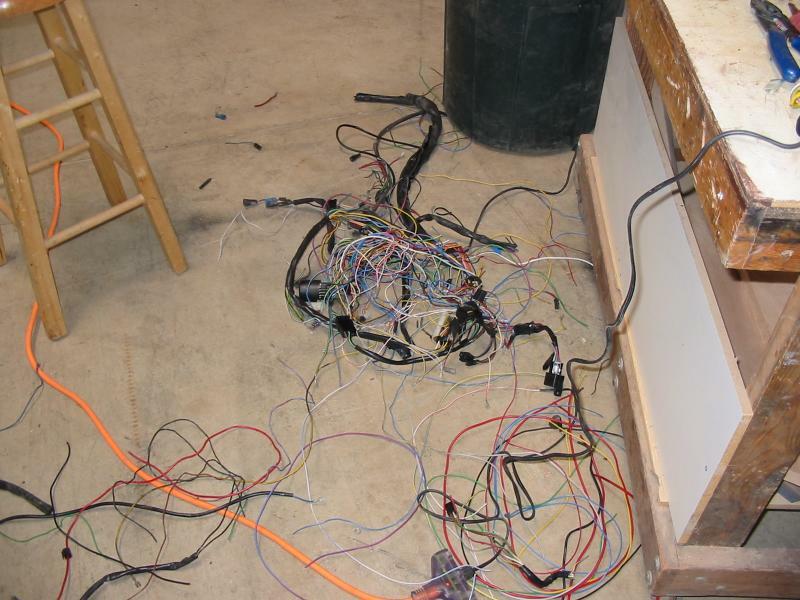 This is also in the height (or depths of hell) of rewiring the car. While challenging, I removed a lot of weight and simplified things quite a bit. I used a painless wiring fuse block and this set up worked rather well. Right around early July my header from www.proturbo.fi in Finland showed up. While it took a bit of work to make it fit and plumb everything up, this was well worth it. Dropped the spool up of my holset by 8 or 900 rpm, and made it very responsive. 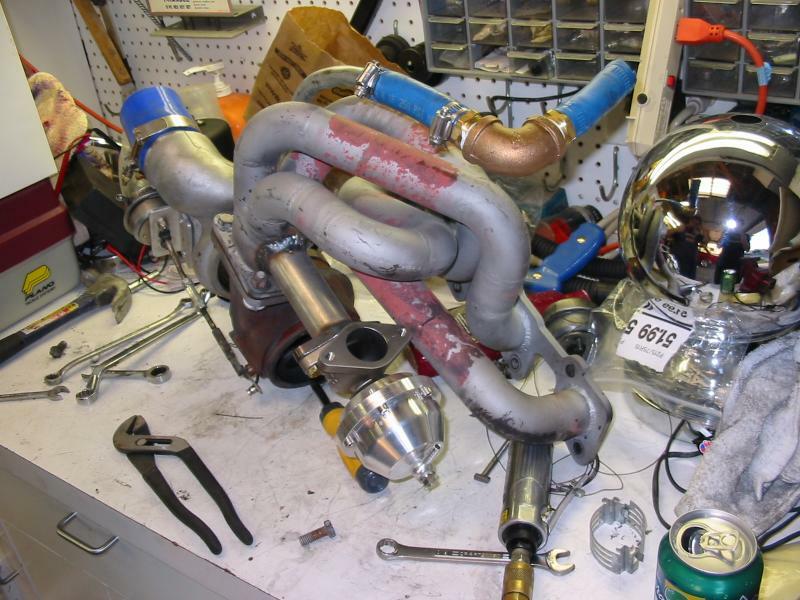 Proturbo makes 16vT manifolds as well, and are all now single mandrel bent polished Stainless Steel pieces now. 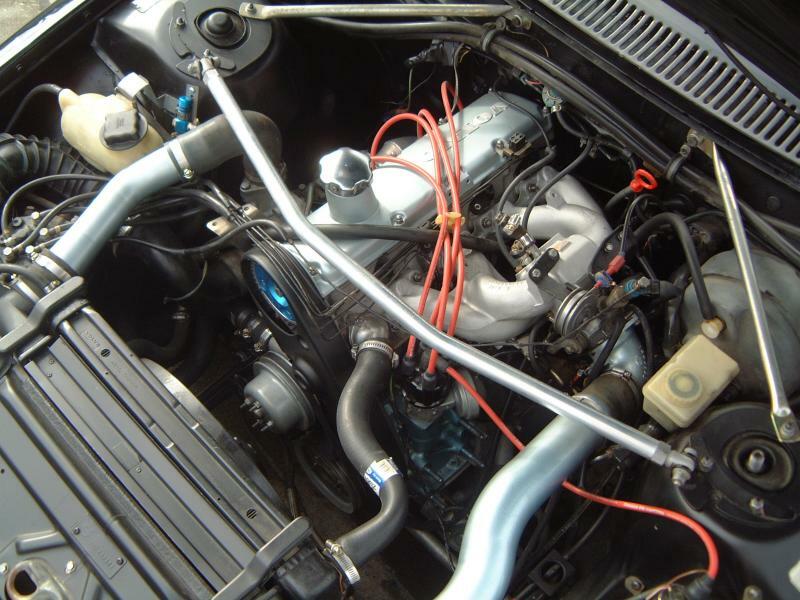 By late July I had the motor back in the car, albeit with a new turbo, a Holset HY35W. Its shape made it easier to fit into the car (on the header), plus it had a 4” exhaust outlet and better spool up (slightly smaller A/R redesigned exhaust housing). 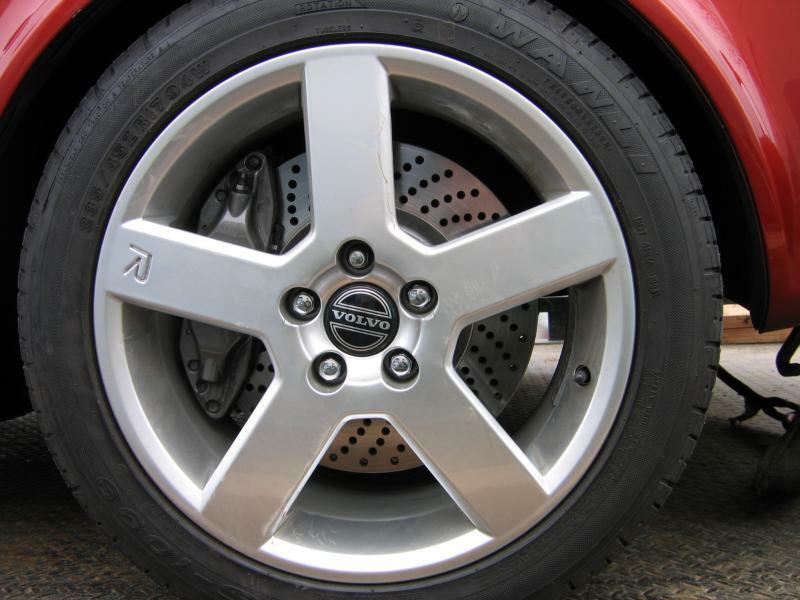 All that I was waiting on was the clutch and flywheel which I had outsourced through another company. The clutch/flywheel was a disaster. 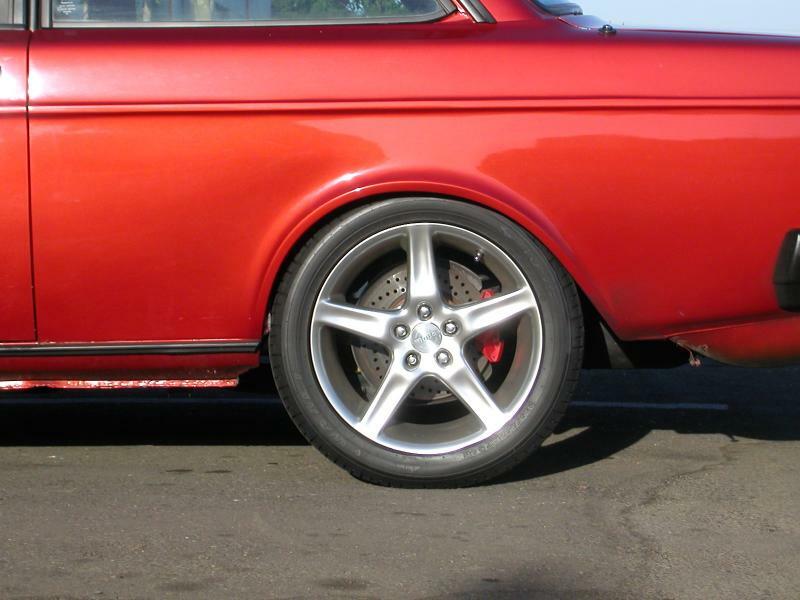 Going from a local recommendation, I contacted a shop about 2 hours away 6 months in advance of the Western Regional Volvo Club of America show about doing my clutch and flywheel. 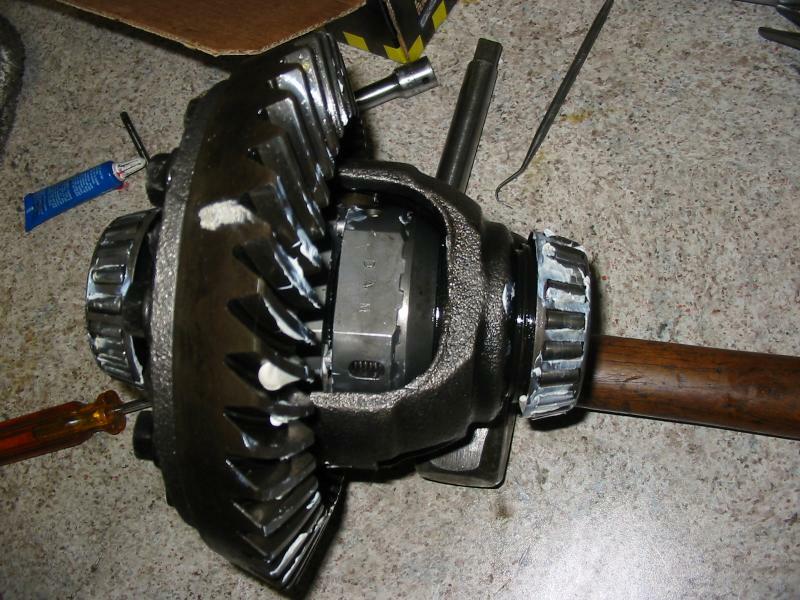 Long story short, with 6 days to go, they had finally built my clutch (but not the flywheel) but used the wrong spline and I wouldn’t be able to make the show. Likewise to say, I was very angry (rooms were already booked). I talked to John Parker who informed me then that he could do the clutch and flywheel no problem (for some reason I never realized this). This again is where I have to give an absolutely GLOWING recommendation for John. 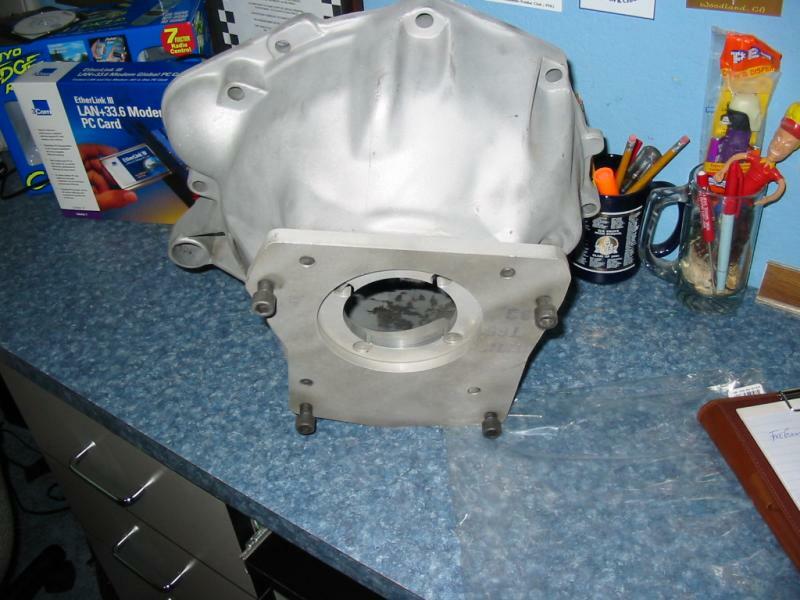 In 4 days he built my clutch and flywheel and had them overnighter to me for an exceptional price. 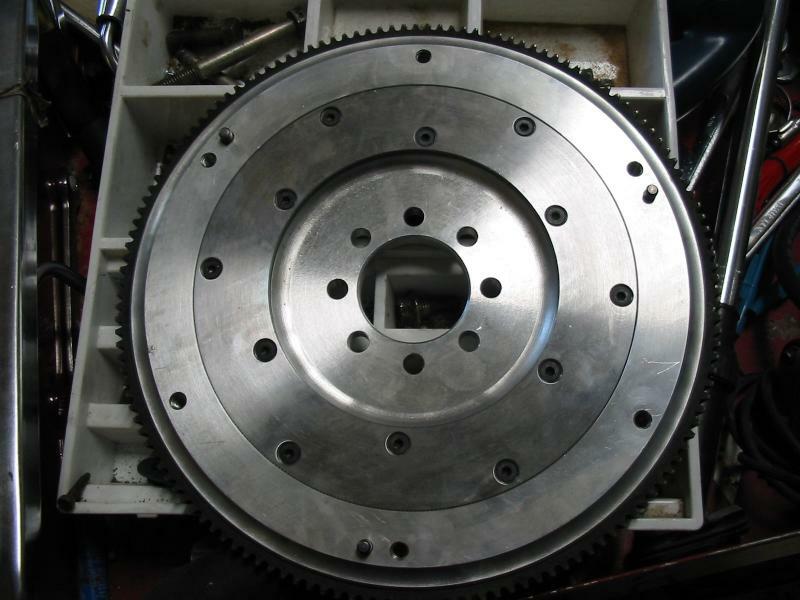 The flywheel was a 9 pound aluminum unit and the clutch was a carbon/carbon Clutch-net clutch (purchased through John to his specs). So far this setup has been flawless. I recently pulled the clutch to check on it and it showed almost no wear, hot spots ect. The only problem I had was this clutch took quite a while to break in (probably complete at 1k miles, really grabby by 500 though), but it is insanely grippy, though with very easy (lighter than my Centerforce clutches were) pedal play. I am very happy so far. Once again, hats off to John Parker. Luckily, after some major engineering I completed the T5 swap after 2 days of solid labor (including about 2 dozen times of pulling and reinstalling the transmission) and was able to make it to the Washington show. The T5 swap was painless with exception to one area, the pilot bearing. Once that was handled this transmission has been worth every penny. Shifts nice, robust, and actually having a true OD (that works) has been the best part of all. After this, I pretty much just began to drive and enjoy the car, though I began having problems with massive boost creep (as much as 40psi spikes) that I tried numerous things to resolve. Finally, I installed a Tial 38mm external wastegate and the problem was solved. I’ve always had trouble with internal gates on all my turbo’s, after going external my boost has been rock stable at any level and even with better spool up. Id never go internal again. 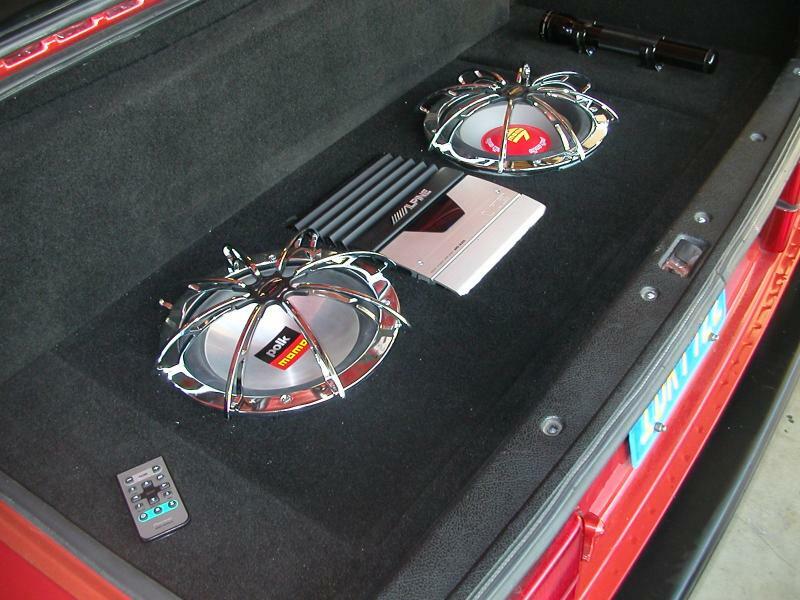 The last thing I did to my car in 2003 was install a Powertrax Locker. This is exactly what it sounds like, a “ratcheting” locker for the rear axle. The installation took me just over a day (I could do it in half a day now that I’ve done it once) and the results were worth it. Traction is great(!) and I find the unit to be not nearly as harsh as I thought it would be. After that, it was just flat out and enjoy the car, until Thanksgiving when I lost my head gasket “trying out” my new locker. For that and more you’ll have to read the “2004” thread. 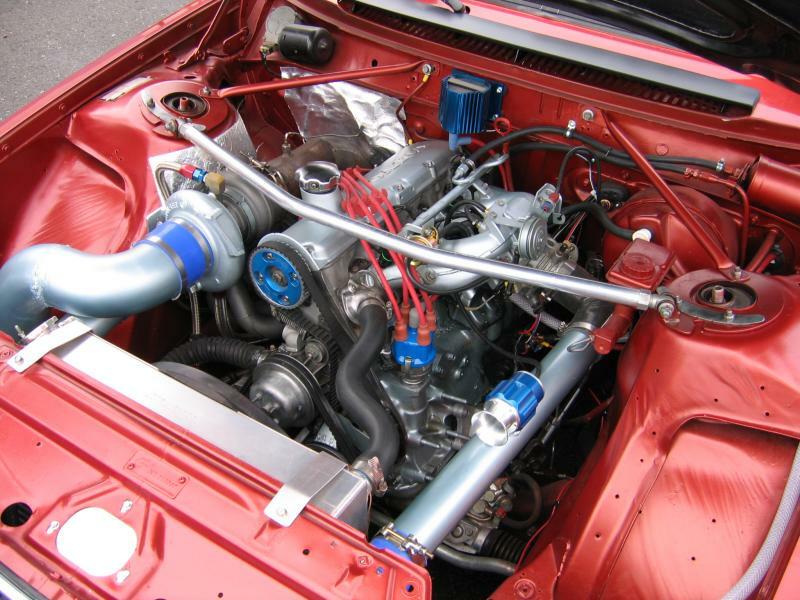 I've answered alot of posts lately about using a TurboCoupe Ford turbo, so I thought I'd share exactly whats involved. First off, the T3 TurboCoupe ford comes in either 60/60 trim versions, or 60/48, bigger than the stock 48/48 (?). 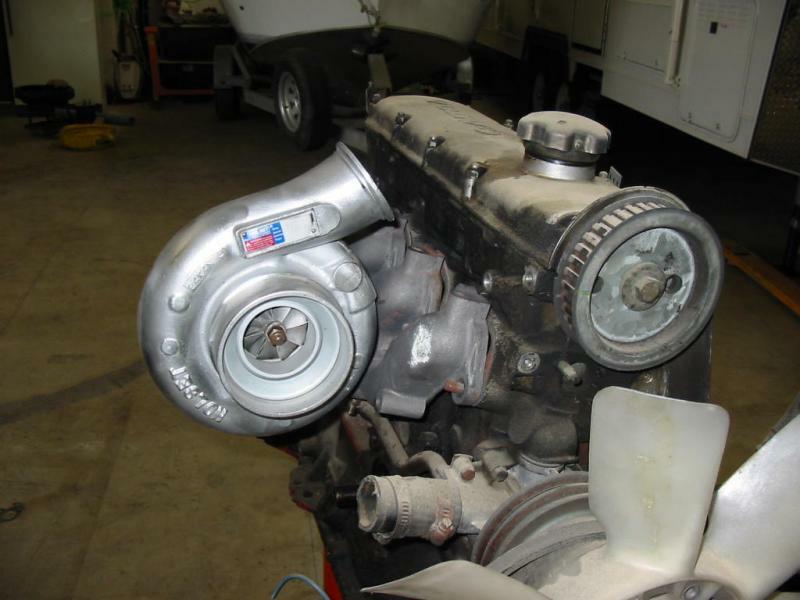 There is two nice benifits from this, the first being more Horsepower (duh) and the second is, its the cheapest, most available turbo upgrade you can find! Another benifit is that the Ford turbos are all watercooled, a great upgrade for volvo turbos. This means however, you'll need the water cooling lines/adapters from either a 7 series volvo, or new. 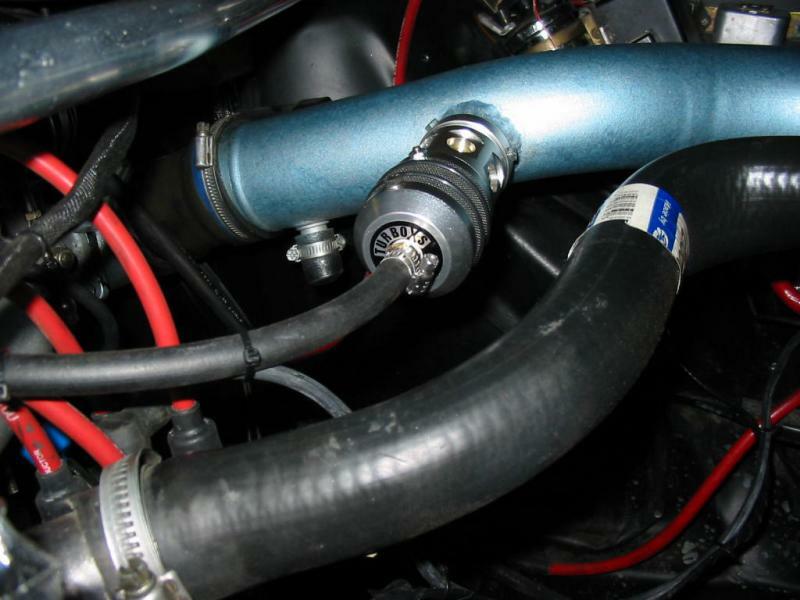 You'll need the two Stainless lines from the turbo, and the fittings that go in the rubber hoses (radiator, and overflow tank return). So heres how it breaks down. 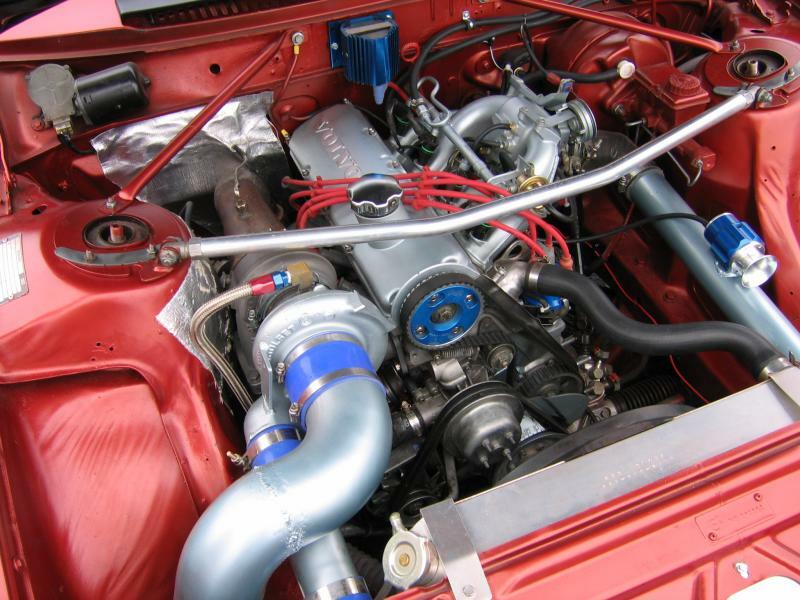 There is one main difference between the two turbos. 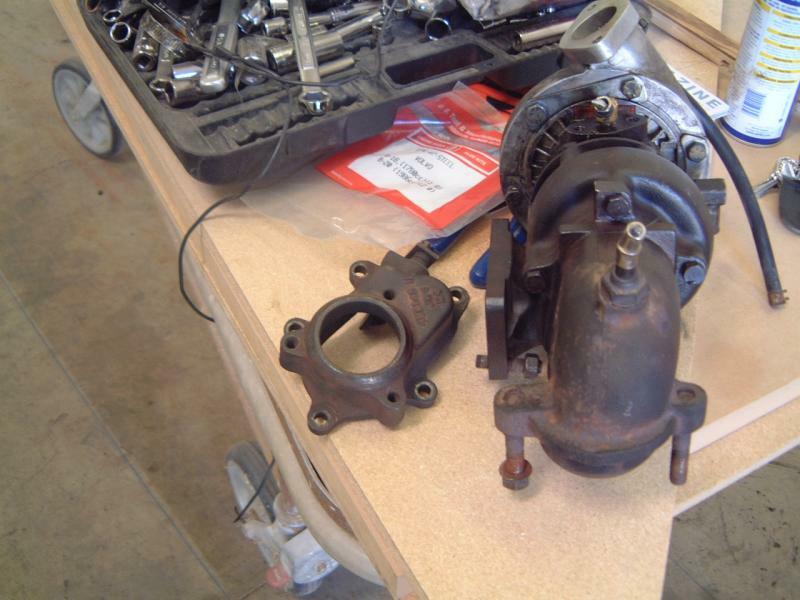 The OE Garrett turbos, and the Ford turbos is the way they mount. The OE (volvo) t3's have a recessed area on the exhaust flange that fits over, for lack of better terms a moutian on the stock exhaust manifold. The Fords use a flat flange and a gasket to seal them. The moutian is easily removed however by a good machine shop. If your hell bent on using your OE or already purchased aftermarket Down Pipe (mvpvolvo's for instance) you can swap wastegate housings rather easily. Word for the wise, use ALOT of WD40 and let it sit over night. If your looking at doing your exhaust and your turbo at the same time, I would get the exhaust flange (just cut the very top portion of the pipe from the Ford) and have a custom one made up using the Ford original wastegate housing. The last major hurdle is the oil return line. While, the feed line isn't exactly right, it is easy to "bend" it to bolt right in. Be careful not to kink the line. (pardon the mess, this was after the freezeplug problems). Another way that is more commonly done is to cut the return line in the middle and use a Rubber hi-temp hose to make up the difference. 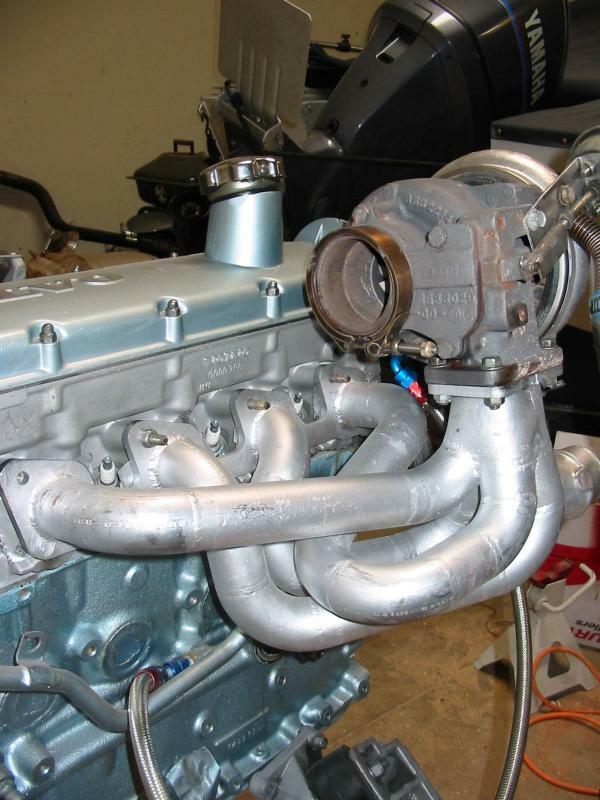 This will give you an idea, but keep in mind, the return location in that picture is different than a Stock Turbo motor. I hope this sheds some light on the situation for everyone! 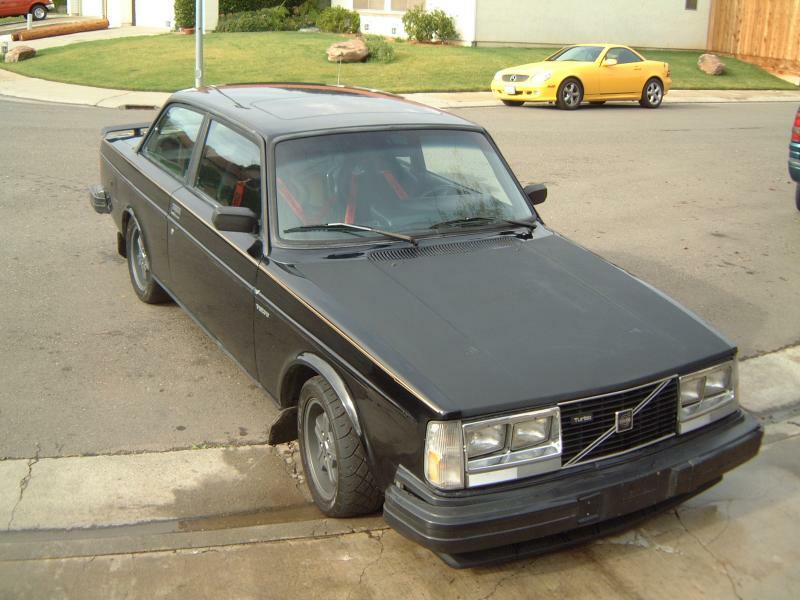 On 240 turbo's there is no sort of pressure relief like later volvo turbo's. 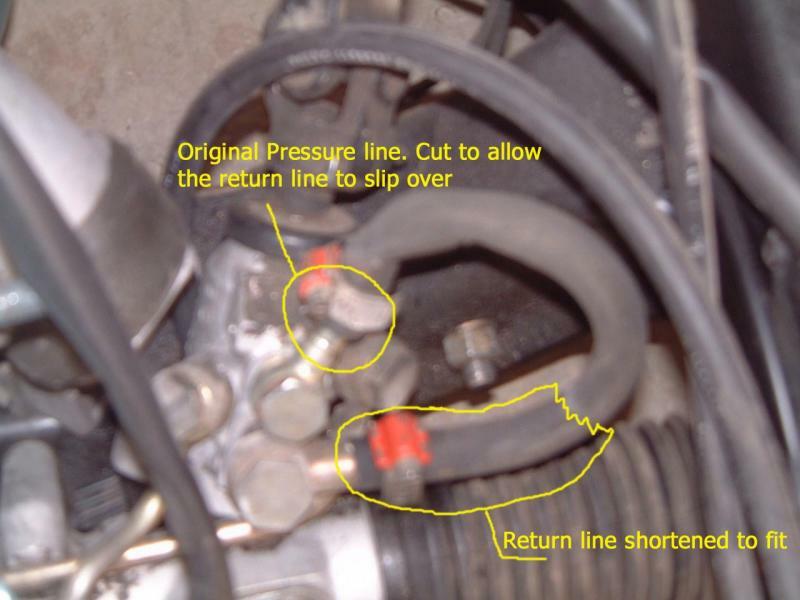 This is important because when you close the throttle at high boost levels, that pressurized is stopped by the Throttle Body (TB) and has no where to go but out through the turbo, the wrong way. This is extremely hard on the turbo and causes the turbo to spool longer after each shift. So, theres really two routes to go. 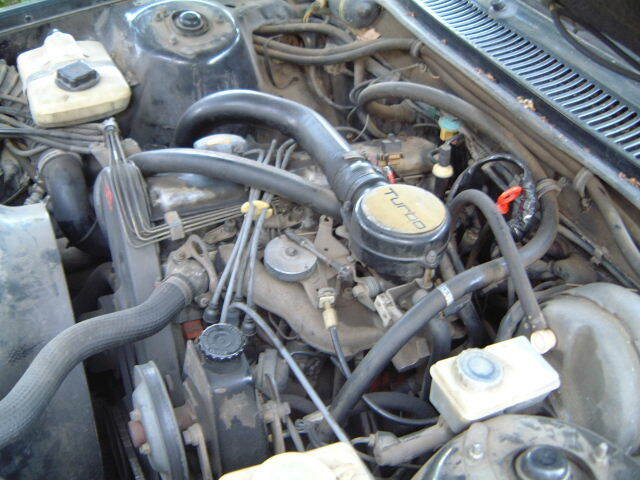 The first is a Compressor Bypass Valve (CBV) which is what most OE turbo systems use. 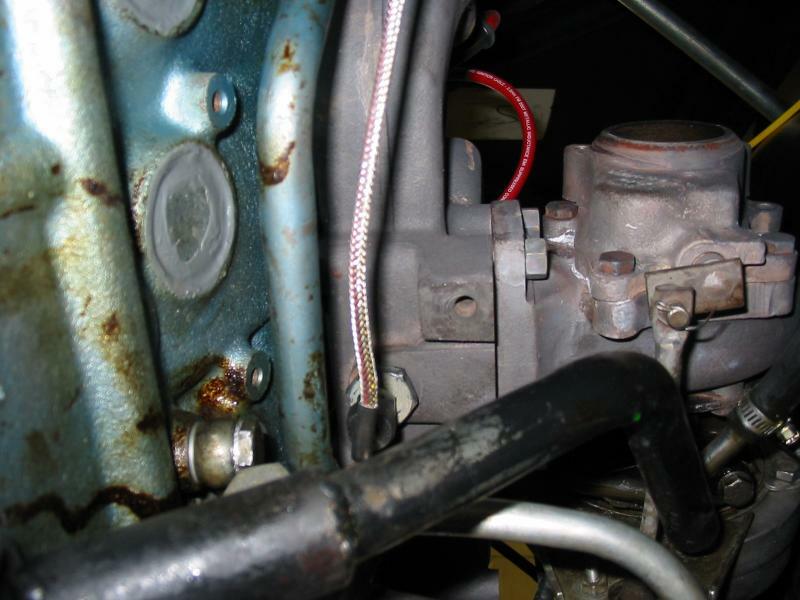 This works by having an open valve that recirculates pressurized air back into the air box under normal cruising. It closes under WOT and then re-opens when you lift of the throttle venting the pressurized air, quietly, back into the air box. 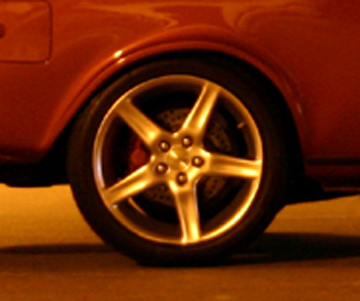 The other style is called a Blow Off Valve (BOV). These are valves that are placed on the piping between the intercooler and TB. It has a piston that stays closed under all conditions except with high vaccuam levels created by getting off the throttle under load. This pulls the piston back and vents the pressurized air to the atmosphere. Its loud, but sounds cool. Some people have said that BOV's because they don't vent the air back to the airbox that it basicly "loses" that pressurized air, causing a rich condition. This would be a problem if the BOV was open all the time like a CBV however, it is not and has worked flawlessly on my 242ti. Even so, a little extra fuel on after a hot run on boost might not be a bad thing. I however, wouldn't use one on an auto, to me it wouldn't be worth the expense to only have it work when you let of the gas once, vs on every shift for an auto. That being said, I know they work just fine on an auto too. Heres a couple pictures of mine, everyone enjoy! Last edited by Hank Scorpio; 06-25-2005 at 07:15 PM..
Well, heres another thing that people have asked about. 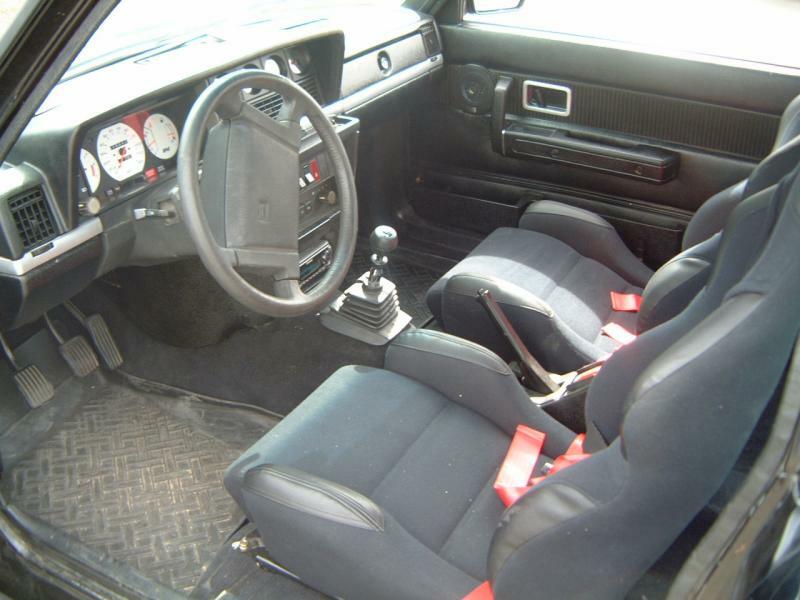 I basicly took the stock power steering rack and gimped it into manual steering. I did this by draining the rack of most of its fluid. Then, I used a saw (sawzall ofcourse!) to shorten the metal line that come off the rack. 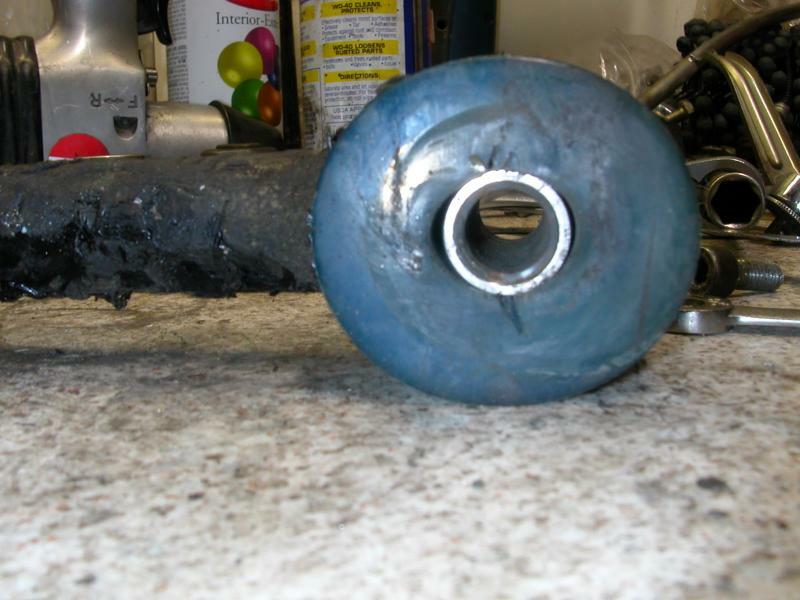 I then cut the rubber return (low pressure) line to a shorter length and sleaved it over the metal line. Over all, I'm more than thrilled with it, very very very few bad side effects. Plus, look at all this room I freed up! I used link rod and threaded adapters from www.hrpworld.com You'll need 4 1/2X20 threaded inserts and matching rod. This is what I used You'll need about 3 feet of rod. 4 bolts, I used 1/2X20 Grade8 3 or 3.25" long, 4 nuts and washers. Grab a few extra nuts just in case. Also, you'll need 4 Jam Nuts for the rod ends, but any normal nut will work. Something metal and tubular that is atleast 1/2" ID. 6" is plenty. OK, so I bet your wondering why you want to do this. 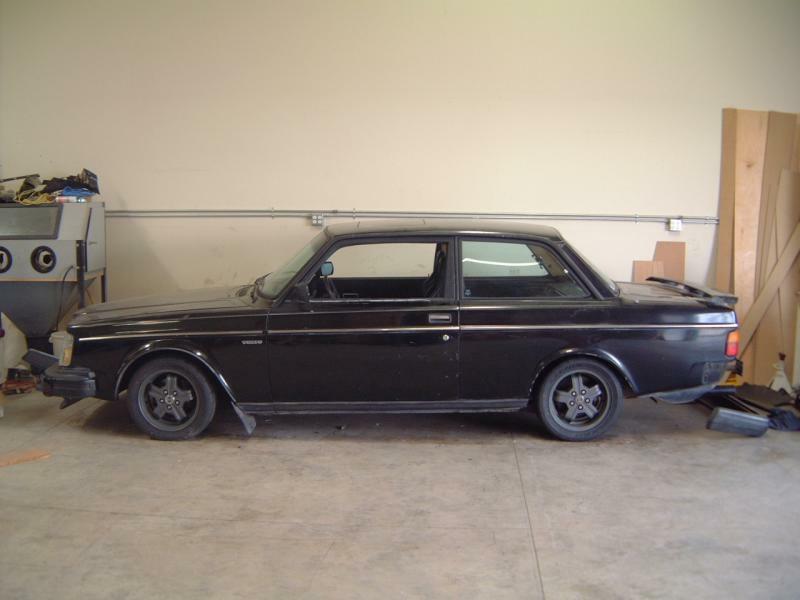 Well, when you lower a 240, it throws the rear suspension geometery off. Everyone knows already about the panhard, but the torque rods also have a negative effect. 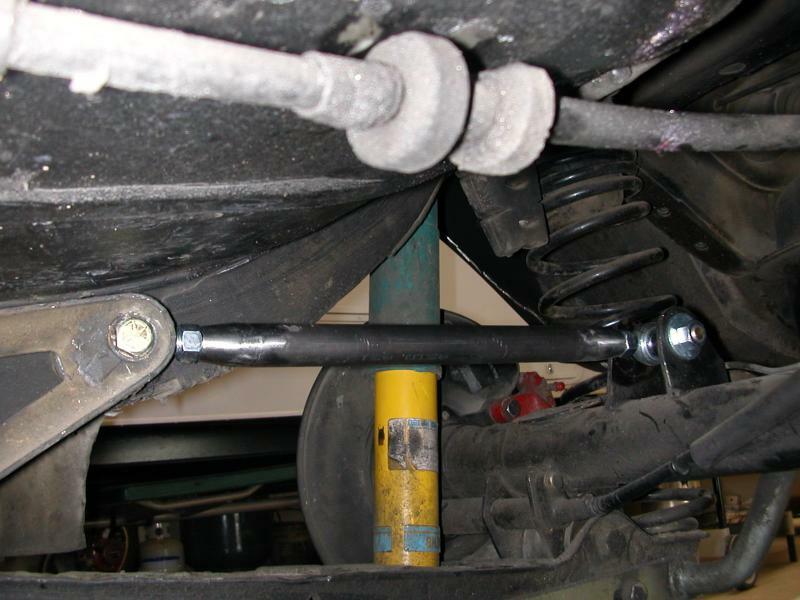 When the suspension compresses (or is lowered) the torque rods fixed length causes the axle to rotate back, or up if you look at the driveshaft. This not only moves the driveshaft closer to the floor but it also causes the wheels to be moved further back in the wheel wells. Mine were not only ovalized, but the mounts were completely cracked through on both sides and both ends! So heres what you need to do. When you get your parts from HRP your going to get the rod in uncut form. What you need to do is cut the rod so that your total length from threaded insert to threaded insert is 12.5". I found this gives plenty of adjustment. Now, you dont cut the rod this long, you adjust for the inserts at both ends. Now like I said, the TOTAL length is 12.5, the adapters you use may vary so be sure to adjust. +/- 1/2 inch or so shouldn't be a problem. Now, I bet your wondering why you need all the standard stuff. Well, our cars torque rods use Metric bolts, or 12mm's. Problem is, the heim joints are made for US standard, 1/2 which equates to 12.8MM. This gives .8mm slack in the joints. Do NOT think this is acceptable, it will quickly turn the bolt into a pretzel if you try to run it this way. So, heres where the drill comes in. You will have to slightly open all the holes that the former bolts went through. Piece of cake. You should be able to slide your bolt through like this. The car side is a bit more challenging. 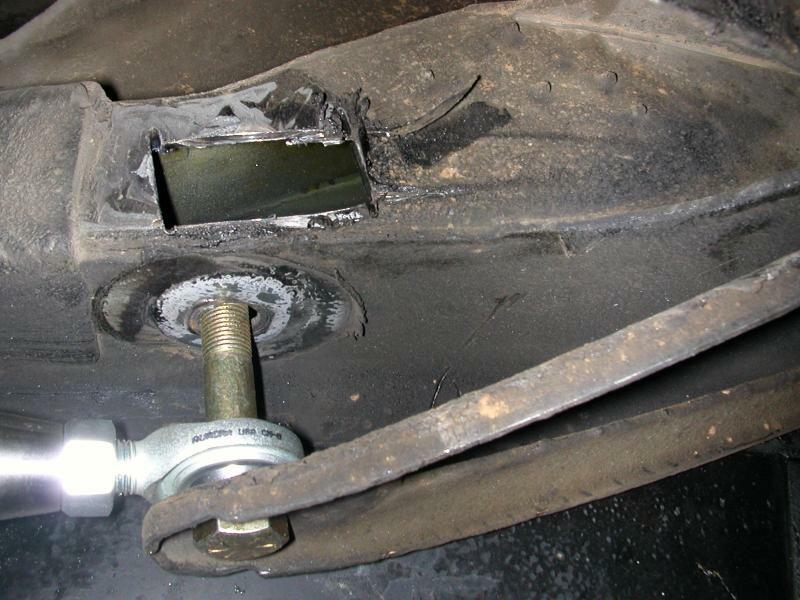 Obviously, the bolt threads into the frame rail. The outter bracket is easy to modify, so just drill out the frame with the 1/2" drill through the threads. You could probably actually rethread this with a tap for 1/2X20 threads. Then, I slid the bolt through, using fender washers on both side and just put a nut on the other end. 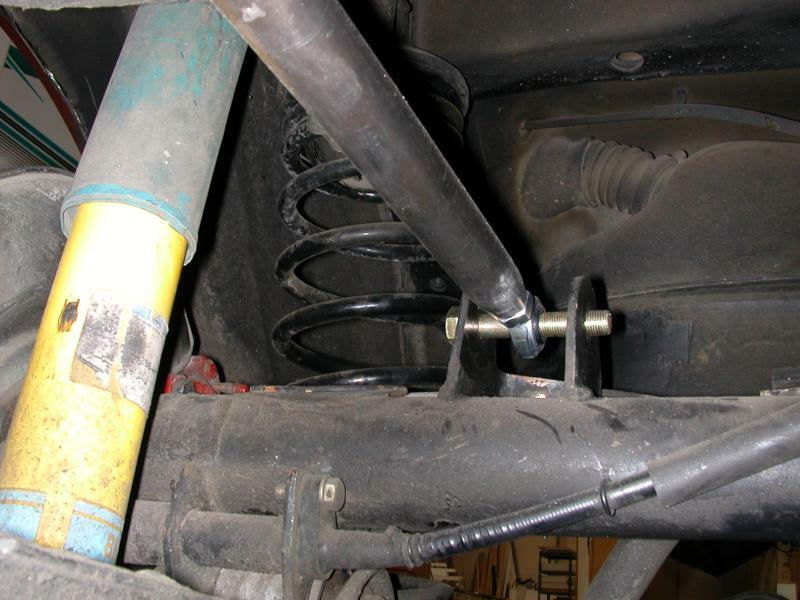 Now, before you do this, you can obviously see that theres some "slack" between the rod end and the bolt ends. What you need to do is make some "spacers" to take up the slack. 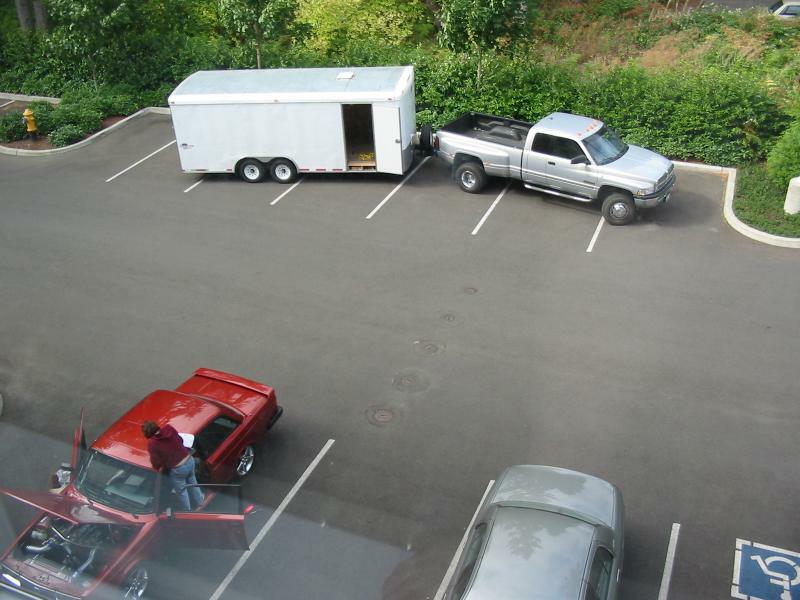 Obviously, your sizes will vary so just do your best. I found the best techique is to leave one side completely off. Mount the one rod and adjust it where you think you need it. Jack the axle up to just before it picks the car off the jack stands. Look at the side of the car and see abouts where the wheel falls in the well. When you think you've got it close, lower the car on to the ground and see if it looks good. 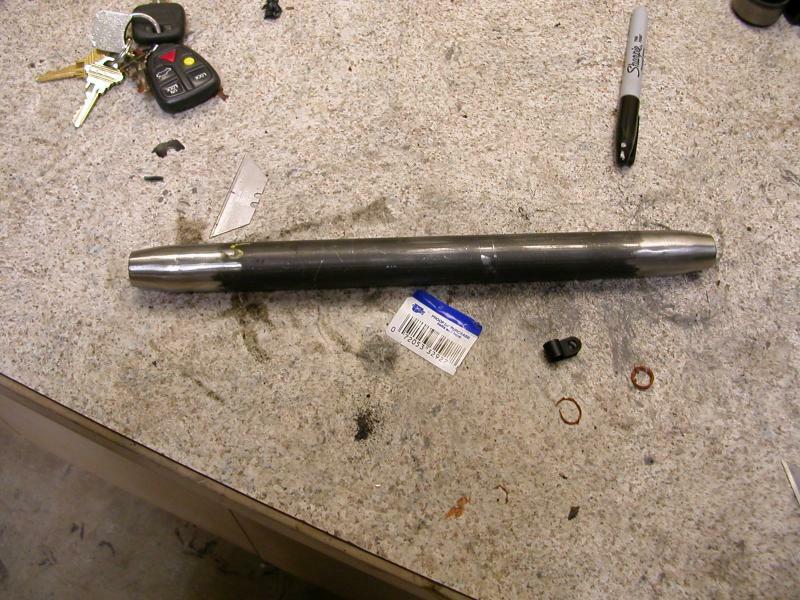 When it is adjusted right, install the other torque rod to the same length. or even more centered if you want.